In a departure from our normal articles, we thought we’d bring you a piece of video this week, filmed at the recent Waterford Writers Festival and featuring best selling author Jane Casey. Jane Casey was born and brought up in Dublin and studied English at Jesus College, Oxford, followed by an mPhil in Anglo-Irish Literature at Trinity College, Dublin. Married to a criminal barrister, she lives in London and before becoming a full time writer (and mother) worked in publishing as a children’s books editor. Her first book, The Missing, was published by Ebury Press in February 2010. This was quickly followed by The Burning (November 2010), The Reckoning (July 2011), The Last Girl (2013), and The Stranger You Know (2014)With a unique insight into the brutal underbelly of urban life, from the smell of a police cell to the darkest motives of a serial killer, the gritty realism in Jane’s books has made them international bestsellers and critical successes; while D.C. Maeve Kerrigan has quickly become one of the most popular characters in crime fiction. “All my criminal elements have some basis in reality, no matter how awful they may be. Nothing is completely farfetched.” Jane says. Twice shortlisted for the Irish Crime Novel of the Year Award as well as the Mary Higgins Clark Award, Jane has also been longlisted for the CWA Dagger in the Library Award. 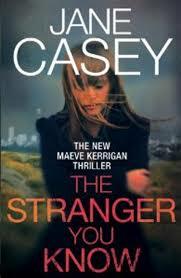 Her last book The Stranger You Know focuses on the murder of three women – all Maeve Kerrigan knows about the man she is hunting is that three women have been strangled in their homes by the same sadistic killer. With no sign of a break-in, every indication shows that they let him in. But the evidence is pointing at a shocking suspect: DI Josh Derwent, Maeve’s colleague. Maeve refuses to believe he could be involved, but how well does she really know him? Because this isn’t the first time Derwent’s been accused of murder. The Stranger You Know is a gripping page turner with the most unexpected twists – but part of the skill in creating a series is ensuring that your character develops over many books, as well as within each book.